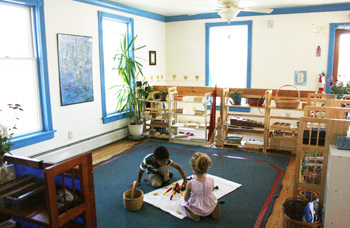 Montessori at the Old Schoolhouse is a diverse and engaging educational partnership of parents, teachers, children and community. Our school was founded in the Fall of 2004 by sisters Anna and Josephine Salvatico, who bring to it over 20 years experience each teaching toddlers, preschoolers and kindergarteners with the Montessori approach. At the schoolhouse, we nurture a child’s love of learning and sense of responsibility, using child-centered philosophies, curriculum and materials to develop the intellectual, physical, moral, artistic, emotional, and academic excellence inherent in each child. Over the course of the year, our children grow in a Montessori environment to become self-assured, independent, vibrant students who love to learn. We encourage the parents of both prospective and enrolled students to visit! Contact us to set up a time. Montessori at the Old Schoolhouse is located on the rolling hills of the founders’ family farm in Tivoli, NY (at the corner of 9 and West Kerley Corners). The building is based on the old one-room schoolhouse originally located in Gallatin that now stands at the Dutchess County Fairgrounds. Our school was designed and equipped according to the Montessori principles of order, simplicity, and beauty, yet it also reflects the personality and philosophy of our teachers. The classrooms — the upstairs ones for primary students, the downstairs ones for toddler students — are brightly decorated, clean, child-sized and child-centered. The classroom materials the children work with are all natural. And the rural setting inspires the curriculum to include gardening, nature walks, and the occasional feeding of our sheep and goats. 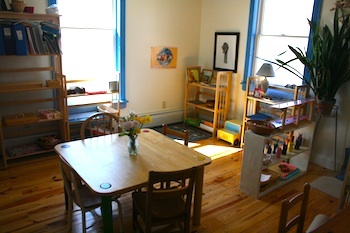 Students aged 3 to 6 years are upstairs in the primary classroom, where maximum enrollment is 21 students. Your child must be within the 3 to 6 span by September in order to enroll in the primary program. 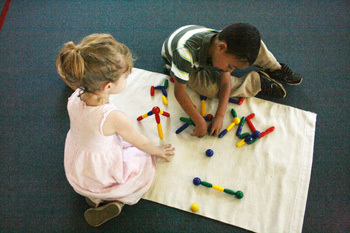 Students aged 18 months to 3 years are in the downstairs classroom, where there’s a maximum enrollment of 10 students. The mixed-age approach of both classrooms exposes younger children to a wide variety of materials and instruction from older children, while allowing older children to share (and thereby reinforce) their knowledge and skills and to develop a wider range of social skills. We also offer a flexible summer camp program in June and July.